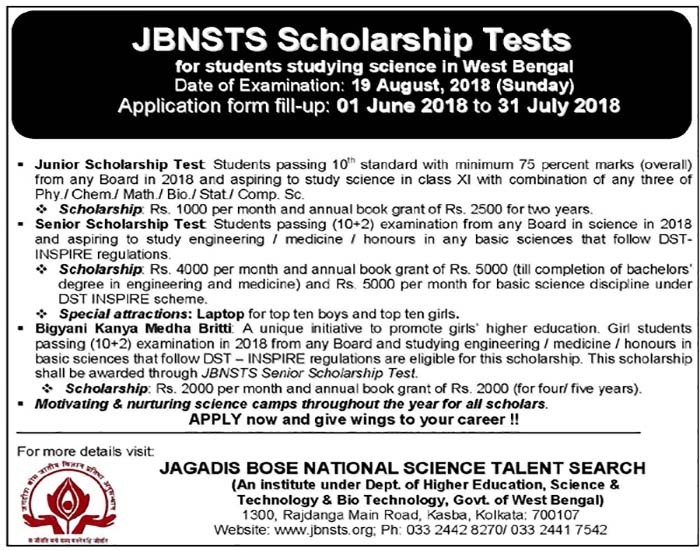 As directed, it is hereby notified for all concerned, that Jagadis Bose National Science Talent Search is going to organize a Scholarship Program junior talent search test. The Copy of the letter vide memo no. Distb/Poster (Jr.)/18/181, dated June 14, 2018 is enclosed herewith for ready reference. 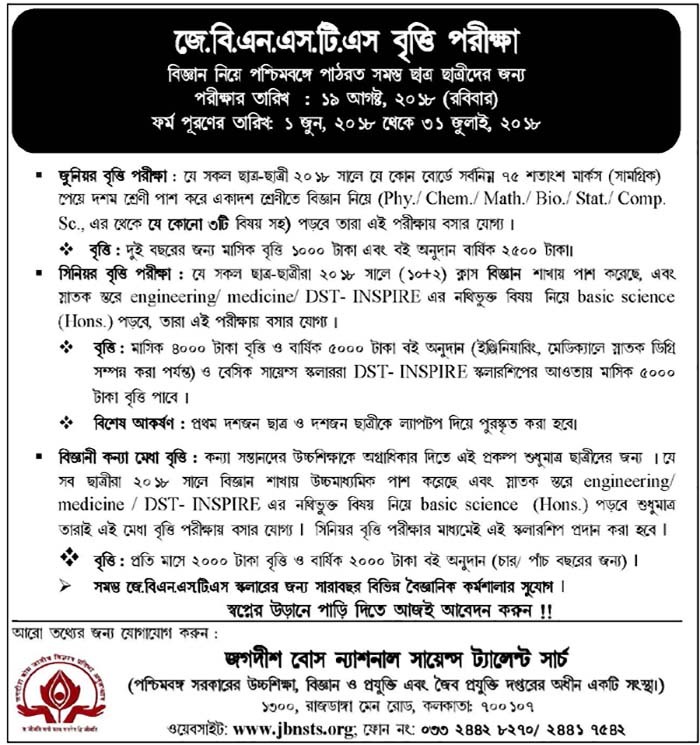 The eligible students may contact Jagadis Bose National Science Talent Search for participating in this programme. You kind cooperation for effective implementation of the same will be highly appreciated. Jagadis Bose National Science Talent Search (JBNSTS), Kolkata is a premier institute of non-formal science education of eastern and northeastern India. The institute is promoted by the Department of Higher Education, Science and Technology & Biotechnology, Government of West Bengal. In order to promote science education and develop scientific temper amongst the talented youth of our state, one scholarship program (JUNIOR TALENT SEARCH TEST) has recently been undertaken by us with special initiation by our Hon’ble Chief. Minister and financially supported by the Govt. of West Bengal. This scholarship program has become very popular among the talented youth of our state within very short span of time (4th year of operation, this year) and students from almost all the districts of West Bengal have participated in our program and got financial and academic support which helped them to build their career in better way. But it is a matter of concern that the number of participants, in this program, is still on the lower side in respect to the number of potential and eligible students across the state. This time we are trying very hard to reach almost all the eligible students (class XI, Science) of Govt. and Govt. Aided Higher Secondary Schools by getting them into our programs. In this context, we would like to request you to make arrangement for circulation, about this examination, among all the schools under the board and web hosting of the examination details in the official website of the board. As, this project is one of the dream projects of our Hon’ble Chief Minister and funded by Govt. of West Bengal, we will appreciate if the Secondary Education Board would join our hands in this noble cause to make it a grand success. We are enclosing two copies of Poster (Hard copy, English & Bengali) and a CD containing the soft copies for this program for you perusal and necessary action, please.